Oh my goodness I am such a bad blogger. So, I last posted at the end of April, and after that the sea of revision consumed me and I drowned. 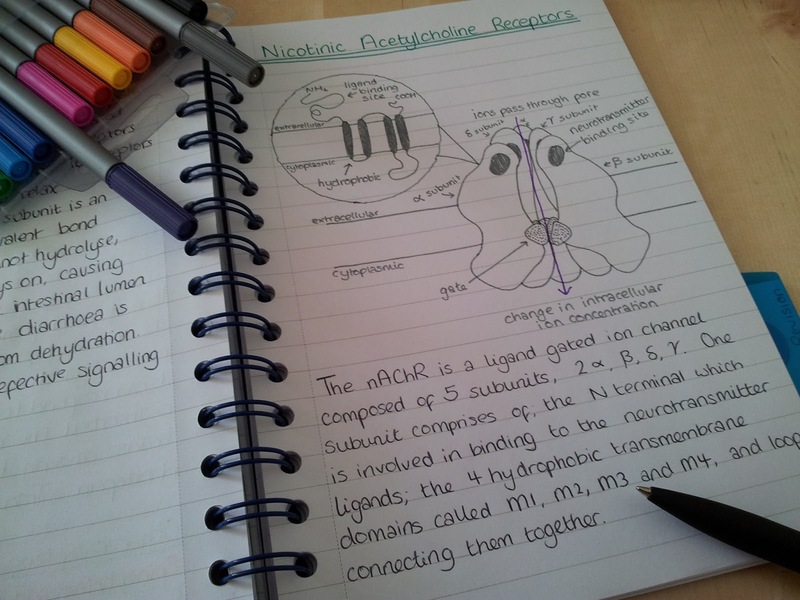 Check out my awesome diagram of a nicotinic acetylcholine receptor! My exam revision technique is about 2 or 3 weeks before my exams begin, I turn myself into a hermit and do very little else other than revise until the exams are done with. This does drive me slightly crazy, but it works for me as I just absorb myself in the world of revision. Between my viva (oral exam) for my professional qualification and my university exams I had a job interview for a permanent contract up north, near to where the boyfriend lives and works. I have NEVER been so nervous about anything in my life, I was so desperate to get this job! 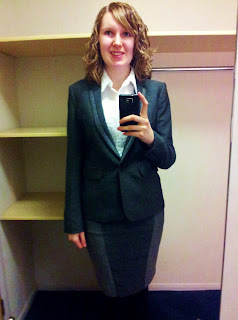 It was my first ever professional job interview, so I went and bought a suit to help feel extra grown up and professional. Skirt £23 and jacket £35 - Next. Nervous face - models own. I'm no fashion blogger, but I love the suit, it's comfy and looks good, and being part giant (5'11) having the option to mix and match between tall and regular lengths really impressed me. I went for a tall jacket and regular skirt if anyone was wondering. So, after the interview, and the exams, I needed a bit of a breather from life before re-appearing. I went to Download Festival again, and had the most AWESOME birthday ever! But those will have to be discussed in a different post, as this one is already threatening to become a bit long! 1 - I GOT THE JOB!!!! I'm moving up north to live with the boyfriend in a lovely house and work at a new amazing hospital as a fully trained qualified person. It's very very exciting and yet i'm a bit sad to be leaving the Midlands where I know and love. 2 - I GOT A FIRST CLASS DEGREE!!!! Results day was yesterday and I was at work when they were announced online. I didn't believe my eyes for a full five minutes and then nearly burst into tears I was so happy. 4 years of hard work of doing a full time degree whilst working full time has paid off in the biggest and best way. I'm back people! And promise to try and blog a lot more often now (hopefully) my life has calmed down a bit. Have you had any good news lately? Share the goodness in my comment section below!